If you’re in need of an extra nudge to throw a “My Favorite Things Party” this holiday season, look no further. This ultimate how-to guide will cast all doubt and intimidation aside and send you confidently on your merry way. I walk you through all of the party-planning steps, but with a bonus! Most of the steps include optional twists with lots of room for creativity and your own personal touch. Making the party features your own will allow you to plan and customize based on group size, personal preferences, and effort you want to put into it. If you’ve never heard of a “My Favorite Things Party,” here’s the gist: guests bring anywhere from 1-3 unwrapped gifts valued at an amount you set, and they walk away with the same number of items. At some point in the party, each guest explains – or gushes about – why her gift is one of her “favorite things” and how everyone needs (insert her favorite thing) in her life…it could be something as luxurious as a paired bath bomb and candle to something as simple as a pack of command hooks. STEP ONE: You choose the value and number of gifts you’d like guests to bring. When I host mine this year, I’m asking guests to bring two gifts, each valued at $10. Down below I share exactly what the guest instructions looks like. OPTIONAL TWIST 1: If you want to go gift-lite for your party this year, maybe have your guests bring one actual gift and one intangible. Options of intangibles could be their favorite mom-hack, podcast, TV show from 2018, holiday station on Pandora, etc. You wouldn’t have to ask for these responses ahead of time. They can be written on a note card when guests arrive, dropped in a bowl, and read aloud at intervals throughout the party. Maybe after every person gets a gift? Lots of room for creativity here, and great way to inspire conversation! OPTIONAL TWIST 2: Who says the gifts have to be for you? Challenge guests to bring a favorite of their spouse, baby, child, or pet, and bring home a favorite that you give to your loved one. Life Hack Products – maybe someone will teach you a new use for command hooks? OPTIONAL TWIST: Extend your theme into your food, drinks, and decor. For example, if your theme is favorite books, select menu items that channel that particular title. I chose to use Paperless Post for the elevated email-invite experience without the paper waste and fuss of mailing. One paper Christmas card a season is about all I can handle anyway. You can see the full text on the adorable card below. OPTIONAL TWIST: Who says the guest list has to include females only? Throwing some men in could add an extra layer of fun – you may just want to include instructions for gender neutral gifts on the party invitation. This method gives guests a choice on what they go home with. Guests draw a number, and go up to the gift table to “shop” for the number of allotted items when their number is called. This method leaves gifts up to random chance. Guests draw the number of guest’s name X the number of items brought and receive the gift(s) from those people. 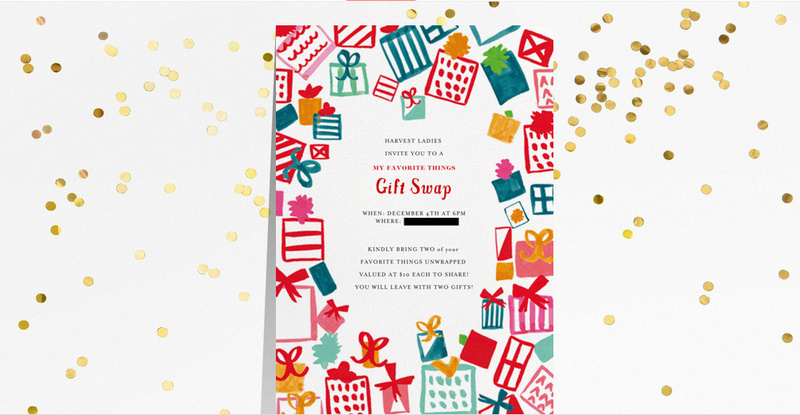 OPTIONAL TWIST: Keep the giver anonymous by asking guests to wrap their gifts and include a note that explains why the item is their favorite. If you go with this twist, you would want to include this instruction on the invitation. Not only will your guests be excited to receive an unexpected extra before the big gift exchange, more introverted guests will also be relieved to hear what a “my favorite spiel” sounds like before their turn. If you have hosted or plan to host a My Favorite Things party this season, share your signature twists in the comments below!